So here’s how our Halloween costume choice came about, here is the poodle-skirt tutorial and now onto the Letterman’s cardigan tutorial!! I didn’t want to be boring and just go with white shirts and jeans. Not much of a costume for the boys. And I can’t buy them all T-bird jackets! All that and it’s COLD! I mean it’s SNOWING here already. INSANE! So I bought 2 XL men’s cardigans in a charcoal grey. Then I found my third one in the womens section. But it will work great for Lego boy. My husbands cardigan is just fine the way it is, it just needs the letter added to it. But the boys both need to be chopped up and re-sewn together! One was a little easier than the other, of course that’s the one I took pictures of. So I’ll mention the issues with the other one, but the tutorial is slightly easier. I started out with a sweater! And in order to get the right size I grabbed a sweater that I know fit’s my son right. Laying it on top I pinned around the shape. 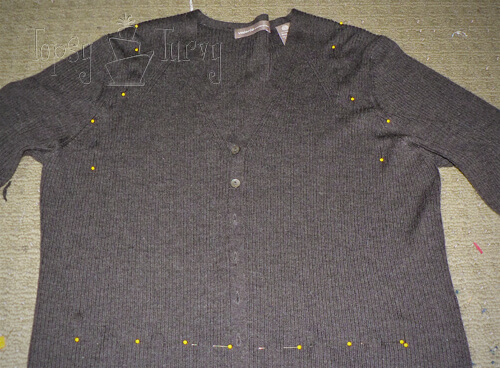 It’s hard to mark knits so I used pins to mark the body. 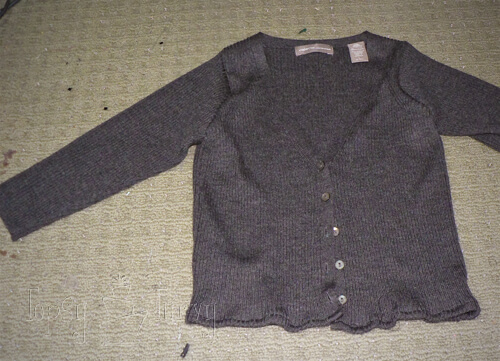 This was the women’s cardigan so the collar was actually the right size already, but the other, larger cardigan’s neck hole was too big. To make up for it I just cut the back and front separately. The back was high, using a portion of the collar, and the front was lower using a smaller v of the collar. Next was the sleeves. I did the same thing, laid the right size sleeve on the cardigan. and used pins to mark where to cut. Time to cut! 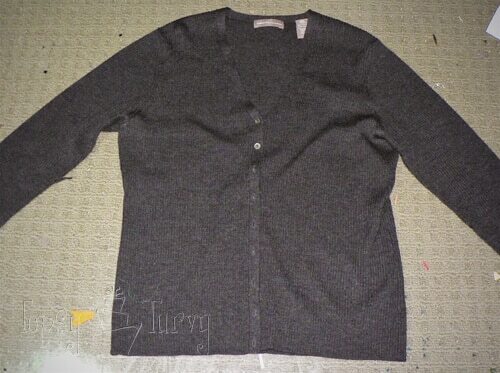 This sweater only needed a few cut’s, the larger one had WAY more cuts, not only at the collar and shoulders, but also I cut and moved up the waist band as well. But I was glad this one was so much easier! It went fast and fit well. 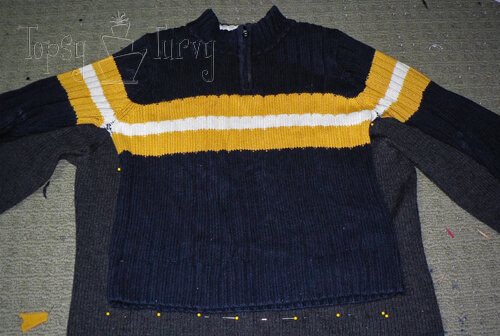 The biggest difference in the two sweaters when it comes to sewing is the sleeves. 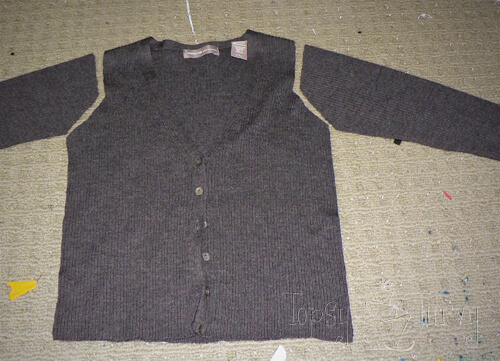 Because the larger cardigan’s sleeve were open first I sewed the arm holes together. Then I sewed the sides and the arms together at the same time. 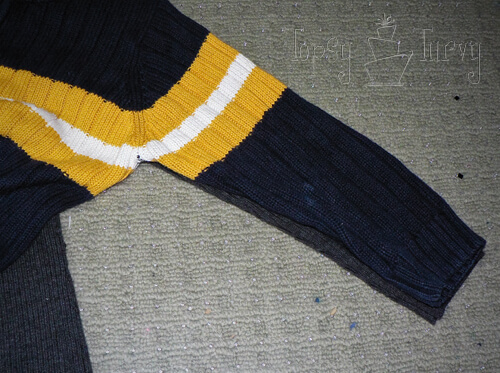 With this cardigan here the arms were already sewn down the sides. So I sewed the sides of the body, and hemmed the bottom. 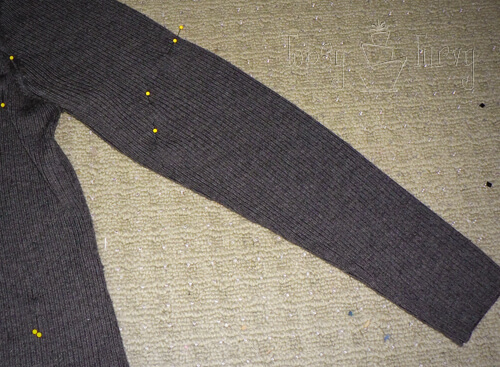 Then placing the body inside out and putting the sleeves inside I finished by sewing the arm holes together. So the sweaters are resized and ready for their letters! I cut out the letter in back with the outline in red. Using the interfacing I stuck the red and black together! 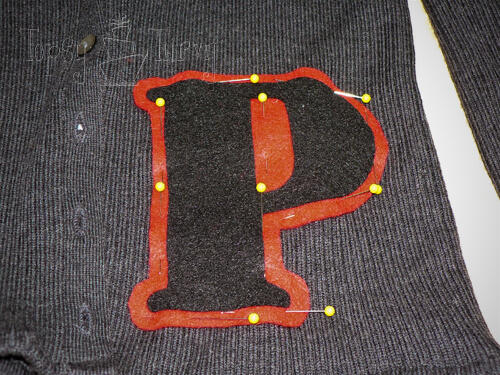 Now the fusible interfacing won’t work on the sweater so I knew I’d need to sew the letters on. I picked P 1) P is the start of our last name, duh. 2) P start’s Pig and this way they match up to the girls well! Then I pinned them to the sweaters and sewed them on right where the black meets the red! They turned out even BETTER than I imagined they could! Paired with a white t-shirt, jeans, white socks and black dress shoes and we have our 50’s hunks! Maybe a pair of nerd glasses would really really kick it up a notch! I was the most nervous about how the boys would react. Would they be willing to go with it? Or would they throw a fit because it wasn’t a dragon, or something more “cool” I prepared them before hand (preparing our Aspie kids is a normal part of every day life, things go much more smoothly when we do) and made a deal with them. If they would wear the family theme for the Family Trunk or Treat night they can wear what they want for their school Halloween parade/parties. It worked. They agreed, they were even happy and they were happy with the theme! They even said they want to wear them for the school parade. We’ll see if they stick with it! My boys are so handsome! Great tutorial!! 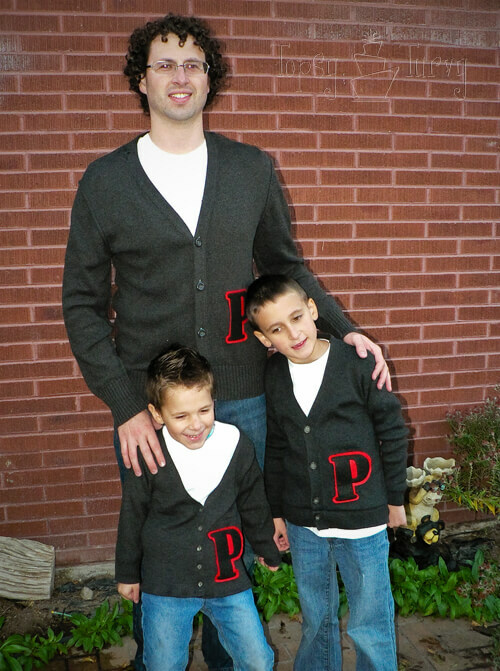 I love your husband and boys all with those cardigans. So cute! I do have handsome boys! Lucky me! I love family theme’s and matching costumes. I was the same age as my oldest when we did poodle skirts as a family when I was growing up! Fun to do it again! But since my Dad was the only boy in the family (I only have sisters) he did the greaser route and wore a leather jacket with rolled up jeans and sunglasses. Hot stuff. Thanks As a group it worked really well, when the boys were by themselves? Not so much!